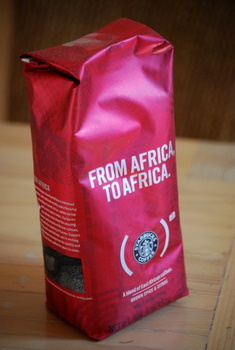 (Starbucks)RED is a whole bean coffee that Starbucks introduced to support the (PRODUCT) RED charity, a charity that partners with various retailers to raise money through the sale of special products that goes towards providing treatment for children and adults living with HIV in Africa. In the case of (Starbucks)RED, $1 per pound of this blend goes towards the charity, so you get good coffee and support a good cause all in one cup. The coffee itself is a blend of Rwandan and Ethiopian coffees that is supposed to evoke some of the classic characteristics of African coffees. It is bold and smooth, with fairly low acidity, and notes of citrus and a sweet spiciness. The spiciness actually seemed to hint at the sweet-spicy combination of fruitcake, which is not too sweet but fairly rich tasting from all the dried fruit in it. The coffee also had a slight bitterness to it, like the pith of a citrus fruit, but it was subtle and made the coffee a little more interesting.